Our fitness classes are not for the faint of heart. They are for people who want that extra challenge to take their training to the next level. We run boot camp style workouts with functional bodyweight exercises and kickboxing fitness. We scale exercises accordingly so everyone can work to their own limit and reach your goal whatever that may be. Whether your goal is shed some weight, get stronger or have the endurance so you can go the distance, these fitness classes are for you. 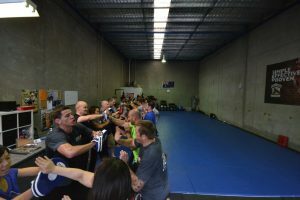 Compliment and fast track your Krav Maga training and try a fitness class today.